On February 4th, 2014, students from the Universidad Nacional Experimental del Tachira (Experimental University of Táchira), located on an inland state of the country, protested due to the sexual assault of a fellow female classmate in lieu of the current insecurity situation of the city. The protest was repressed, and several students were detained. The next day, other universities around the country had their own protests requesting the release of these detainees, being at the same time repressed and some of them incarcerated. The wave of indignation had the context of the economic crisis, the shortage of first necessity items and the crisis of basics public services, as well as the beginning of the enforcement of an economic plan on behalf of the President Nicolas Maduro. Two opposing politicians, Leopoldo Lopez, and Maria Corina Machado, tried to capitalize on the wave of discontent rallying for new protests under the slogan “The Way Out” and try to pressure for the resignation of president Maduro. Their message also reflected the rupture and divisions on the inside of opposing politicians and the desire to replace Henrique Capriles’ leadership, who publicly rejected the protests. The Mesa de la Unidad Democratica (Democratic Unity Table) coalition, didn’t support them either. When the government suppressed the protests, it made them grow bigger and wider all over the country. On February 12th, 2014, people from 18 cities protested for the release of all of the detainees and in rejection of the government. In some cities, inland, particularly punished by scarcity and lack of proper public services, the protests were massive. In Caracas, three people were murdered during the protests. The government blames the protesters, but the biggest circulating newspaper in the country, Ultimas Noticias (Latest News), who receives the biggest advertising budget from the government, reveals through photographs, that the murderers were police officers. As a response to this, Nicolas Maduro stated on National television and radio broadcast that police enforcement had been “infiltrated by the right wing”. Repression against protesters not only uses police and military enforcement agencies, it incorporates the participation of militia groups to violently dissolve the protests. A member of PROVEA, a human rights NGO, was kidnapped, beaten and threatened to death by one of then on the west side of Caracas. President Maduro has publicly encouraged these groups, which he calls “colectivos” (collectives). The Venezuelan government actually controls all of the TV stations, and has threatened with sanctions, radio stations and newspapers that transmit information about protests. Because of this, the privileged space for the distribution of information has been the social media networks, specially twitter. The use of personal technological devices has allowed the record keeping through videos and photographs of ample aggressions of the repression forces. Human rights organizations report detainees all over the country (many of them already released), the number has surpassed 400, and they have suffered tortures, including reports of sexual assault, cruel treatment, inhumane and degrading. As this is being written 5 people have been murdered in the context of the protests. In his speeches, Nicolas Maduro, stimulates the protesters that are against him to assume even more radical and violent positions. Without any criminalistic investigation, he automatically stated that each deceased person has been murdered by the same protesters, whom he disqualifies permanently with all of the possible adjectives. However, this belligerence seems not to be shared by all the Chavista movement, because a lot of it’s bases are waiting for what happens next, without any expressions of support. Maduro has only managed to rally public employees to the street protests he has done. In spite of the situation and due to the grave economic situation he faces, Nicolas Maduro continues to make economic adjustments, being the most recent, the increase of the tax unit. The state apparatus reiterates repeatedly that it is facing a “coup”, that what happened in Venezuela on April 2002 will repeat itself. This version has managed to neutralize the international left wing, which hasn’t even expressed its concern about the abuses and deaths in the protests. The protests are done in many parts around the country and are lacking in center and direction, having being called through social media networks. In the protesters themselves, there are many diverse opinions about opposing political parties, by which it is possible to find so many expressions of support and rejection at the same time. In the case of Caracas they are starred specially by middle class sectors and college students. On the other hand, in other states, other popular sectors have joined the protests. In Caracas the majority of the petitions are political, freedom for the detainees y the resignations of the president, while in other cities social demands are incorporated, such as inflation, scarcity and lack of proper public services. Even though some protests have turned violent, and some protesters have used fire guns against police and militia groups, the majority of the protests, specially outside of Caracas, remain peaceful. The Revolutionary Independent Venezuelan Left (anarchists, sectors that follow Trotsky, Marx, Lenin and Guevara) don’t have any incidence in this situation and we are simple spectators. Some of us are simply actively denouncing state repression and helping the victims of human rights violations. Venezuela is a historically oil driven country, it possesses low levels of political culture amongst its population, explaining why the opposing protesters have the same “content” problem as the bases of support for the government. But while the international left wing continues to give its back, and support without any criticism the government’s version of “the coup”, it leave thousands of protesters to the mercy of the most conservative of opposition’s political parties, without any reference to anti-capitalists, revolutionaries and true social change that could influence them. In this sense, the detention of Leopoldo Lopez, conservative opposition leader, tries to make his own figure the center of a dynamic movement, that up until this moment, that this is been written, had surpassed the political parties of the opposition and the government of Nicolas Maduro. What will happen in the short term? I think nobody knows exactly, especially the protesters themselves. The events are developing minute after minute. Is this correct? I know back in 2002 it was not the case, as most of the TV stations then were private channels, mostly owned by the anti-Chavista right. I've certainly seen local pro-Chavist leftists recently assert that the media is still mostly in the hands of the opposition, as an argument against assertions of regime control of the media. It would be good to get clarification on that. The February 21th, we wrote a summary of events for those who are on the outside, oversaturated with information about Venezuela, we needed a chronology of events. It has just 4 days of this story, but there are many new elements that an update is necessary to suggest, that any picture of the Venezuelan reality will change in the next few hours. The first element that stands out is that the manifestations of government critics have continued to the time of this writing, and doesn't seems to stop in the coming days. Venezuelan culture was characterized by the effort to promote short-term results, no permanence in time, so that the sum of each new day of protest politics, contradict itself this immediacy of "doing" in the country. That is why President Maduro uses as one of its strategies encourage its rapid wear, increasing two more days to holiday carnival that will starts on 27th of February, the day when happens the 25th anniversary of the popular uprising of "El Caracazo" when even tens were killed with total impunity. A second novelty, as suggested in our previous paper, is that Caracas has ceased to be the epicenter of the national mobilization. On Saturday February 22 both those pro-government and the opposition, made called to march in the city of Caracas, both with large attendance . However, in at least 12 cities of province, some dissident demonstrations were proportionally, as massive as those that were performed in the capital. In the case of the city of San Cristobal, capital of Tachira (border with Colombia); the intensity of the protests and conflicts where were including students, middle class people, and others from popular and rural areas; has led to the militarization of the city being controlled remotely from Caracas. The state governor Jose Vielma Mora, of the ruling party PSUV, publicly criticized the crackdown and called for the release of detainees, and so far, this one has been the first public criticism from a member of the government, of one decision of Nicolas Maduro. As of this writing, there had been the death of: 15 people in demonstrations or protests related events , 8 of them whose responsibility points to police, military and paramilitary officers, 2 of them victims of " traps " the opposition mounted protests called "guarimba", and the rest by dark events around the demonstrations that should be investigated and clarified (for example, a winding of a 17 years old boy). The reports of the newspaper Ultimas Noticias, supported by pictures and videos circulated on social networks, have forced the Attorney detain officials of the Bolivarian National Guard (GNB ) and the Bolivarian National Intelligence Service ( SEBIN ) to investigate the perpetrating of facts. However, high spokesmen of the National Executive, as the Minister of Communication Delcy Rodriguez and President Maduro continue blaming of all deaths to the opposition. Deserves separate chapter president of the National Assembly Diosdado Cabello, who through his daily program "Pounding with the Hammer", broadcast on state television, makes delusional statements about the causes of the murders. The "Guarimba" is a strategy that opposition sectors initiated by the end of year 2002. It consists of making a protest, in a place considered "safe", (usually in the vicinity of the homes of the protesters); closing the route with barricades and burned trash or rubbers. The "Guarimba" has several features that differentiate it from other events. One is its symbiotic relationship with the coup and the "oil strike" of 2002, so it is loaded from an insurrectional content, prone to physical confrontation with the security agencies. Second, as a result of the above, repeatedly has been criminalized by the government, thereby being an exclusionary strategy: While pro-government people could join a peaceful demonstration by common requirements, hardly they ever do a " guarimba " . Third, generate a broad rejection within opposition groups themselves, as demonstrated by the mobilization in Caracas February 22, where there were many banners of rejection to "guarimbas" as to the actions of paramilitary groups. As President Nicolas Maduro has stimulated repression to publicly congratulate the performance of GNB, not recognizing state responsibility with fatalities, and institutionally legitimized the actions of paramilitary groups by encouraging the "Popular Commands against coup" has generated a hotbed of indignation that has allowed the emergence of the “guarimbas" with some foci in Caracas and cities throughout the country. However, a look at all types of mobilization, that remain on the street in all cities of the country; corroborates that this remains a largely peaceful demonstration. The delivery of the conservative opposition leader Leopoldo Lopez, on February 18th, was a real "performance" to catapult your image as "new leader" of the Venezuelan opposition and be the center of the national protest movement. Their delivery was performed with a mass concentration at the border between the municipality of Libertador and Chacao, in Caracas. However, until today the dynamics of crowds in the street remains decentralized networks, with multiple centers. There are number of calls through the social networks like "pancartazos", "Do national prayers at the same time" and even "bailoterapias". Some, become viral and are assumed by much of the movement. Many opponents accustomed to vertical Leninist organization of the analog era, permanently demands that protests "have addresses" and "common requirements". The government insists that it is facing a "coup", some say "repeats the script in April 2002" and others argue that it would be a "rolling coup". Nicolas Maduro called to confront the protesters on the street activating "Popular Commands antigolpe". However, the two demonstrations called in recent days by the government in the streets of Caracas, doesn't have the support and levels of call made by Hugo Chavez. While the middle and upper levels of government publicly expressed its support for the decisions of Maduro, the basis of Chavismo begins to resent the open crackdown on protesters, which has generated hundreds of images that flow through cell phones. Moreover, the president himself issued conflicting messages about the nature of the hypothetical threat that faces: Calling insistently celebrate carnivals, dancing in front of the cameras, (asking publicly in several opportunities); improve diplomatic relations with the United States, designating its representative to the International Monetary Fund, removing working credentials in Venezuela to CNN (which meant in fact the expulsion from the country), and within the 24 next hours, invite them to transmit again from the country. Although International level, remains the informative media polarization about Venezuela, internally the country continue to suffer a major informative blackout. Nationwide television stations don't report about the demonstrations, nor broadcast live messages of political opposition leaders, while their screens are taken over by statements from publics officials. The government thought the conflict in analog terms, thinking that television concealment plus repression would be enough to silence the protests. Belatedly has initiated a crackdown on social networks, while Internet service, state-controlled, suffer irregular slowdowns and blockages in some of the most popular applications used by users such as Twitter and What'sApp. The radicalization of the two main sides to the conflict, still doesn't make dialogue a majority requirement to resolve the crisis. President Maduro called the realization of a "National Peace Conference", but however, in parallel, his government (and himself), continue disqualifying as "right-wing fascist" the opponents, and its increasing the number of detainees throughout the country, which alleges torture, cruel, inhuman and degrading treatment during their detention. The number of killed people has increasing, injured by gunfire, tear gas and birdshot, increases the spiral of violence and resentment on both sides, doesn't leaving political channels the conflict resolution; payable the way for the military to assume ensure "governance" through a coup, either of trend of the Chavismo, or those who support to the opposition. The bizarre image of a retired general of the Venezuelan Army, Angel Vivas Perdomo, on the roof of his house showing a weapon of war (in the attempt to arrest him after being accused of masterminding the traps located in a "Guarimba" that caused one death in Caracas); have caused a storm of rumors about the alleged "malaise" within the Armed Forces. Plus this, there is series of looting of shops in several places in the country with such a coordination that sum too much suspicion. The events are in full development: The photo of this moment can be completely different in the next 48 hours. We hope to continue to have internet to telling. What is going on in Venezuela ? Article de Simón Rodríguez Porras, du Parti Socialisme et Liberté (organisation vénézuelienne d’origine moreniste, un des rares groupes de l’extrême gauche à ne pas soutenir le chavisme) paru en espagnol le 23 février sur le site http://laclase.info. As the Venezuelan situation changes every day, I should clarify that I wrote this on 01/03/14 at 06:00 pm. Who are the people who took to the streets? They are only upper middle class people of some housing developments, militants of far-right parties and Colombian paramilitary activists, ("Aguilas Negras")? This question can only be answered correctly, referring to the beginning of this cycle of protests in Venezuela. On February 4 students at the Universidad Nacional Experimental del Tachira (UNET), in San Cristobal, staged a peaceful protest against insecurity, caused by the sexual abuse against a student. The protest was brutally suppressed by the Bolivarian National Guard (GNB), the agency of the Venezuelan Armed Forces in charge of "maintaining public order", and 6 students were arrested. 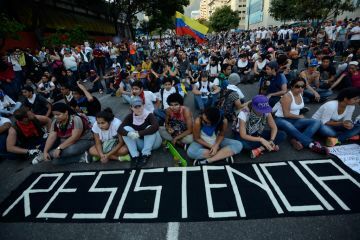 On this episode we should clarify two things: 1) Historically the student movement in Latin America and Venezuela, has always rejected detained students in protests and 2) San Cristobal, capital of Tachira state, is a city located in a border area with Colombia that has been particularly hard hit for several years by interruptions of utilities (water and electricity mainly), price inflation as well as shortages of various consumer products. The arrest of these students led protests in other cities of the country, which in turn were suppressed by increasing the number of students arrested. This created an "snowball-effect", from the inner cities of the country to Caracas. It is in this climate of protests and unrest, which two opposition politicians (Leopoldo Lopez and Maria Corina Machado), make a call to hold demonstrations to demand the resignation of President under the slogan "the exit". It is important to say that the rest of the opposition parties, including the coalition "Bureau of Democratic Unity" (MUD), and the governor of Miranda state, Henrique Capriles; rejected the first few days the protests, which have overwhelmed the political parties opponents. When I write these answers (01/03/14) the protest against the government was decentralized, with some violent foci but largely, peacefully. It also has two different dynamics : One in Caracas , starring with middle class students from public and private universities territorially in the east of the city, and basically with political demands (release of the students, the resignation of President and rejection of repression); and in the rest of the country, qualitatively more important than that one in Caracas because it incorporates popular sectors; and in some cities, (such as San Cristobal), rural areas (thus this city was militarized), and including social demands and lack of products, the high cost of living and lack of basic services. What is the government's response, (the level of repression) ? It is said that it finally has been very soft, forgiving and respectful of human rights. Truth or propaganda? What is the popularity of Maduro now? Maduro, unlike Chavez, is a very weak president internally in the Bolivarian movement. Already been receiving heavy criticism for making a economic adjustment program earlier this year, devalued the currency, increased some taxes and has allowed to the end of 2013, a 50 % inflation. For a political observer in Venezuela, right now, occurs a very interesting phenomenon: While the opposition is mobilized in protests, the basis of Chavismo doesn´t perform public acts supporting the government as happened during the years of President Hugo Chavez. The strong repression of the protests is rejected by large sections of Chavismo basis, who also knows that there is a malaise due to the economic crisis. The few marches by Nicolás Maduro, - exclusively in Caracas - only been able to mobilize public officials and beneficiaries of social policies. The Western media connect the opposition to current scarcity and insecurity. This is reality? First, the polarization of the international media about the Bolivarian government remains the same as in recent years , but inwardly in Venezuela the bourgeoisie of Chavismo has been purchasing media since 2002 , so there is now a lot of censorship in TV channels nationwide , and many pressures on radios and newspapers. There is a deep economic crisis and economic adjustment program is doing pay the costs of the crisis to the country's workers. Regardless of how you end this wave of protests, the government of Nicolas Maduro will continue to implement a package of economic measures that affect all people, especially those with limited resources. Why a country with a big oil wealth is facing daily shortage of the food? The government of Hugo Chavez, and now Nicolas Maduro, has deepened the role assigned to Venezuela by globalized capitalism: Sell oil, gas and other minerals to the global economic market, with the help of transnational companies. The real U.S. embassy in Venezuela is called "Chevron", whose chief business manager for Latin America Ali Moshiri, said dozens of times that "he has not had any trouble doing business with the Bolivarian government". Venezuela sells power to other countries and is importing 80 % of products consumed in the country. As never before the economy depends on the dollar, so having the right contacts in government for receive dollars to the official price, makes possible duplicate that money by 8 times, in few minutes, taking those dollars to black currency market. The dollar has created a "parasitic Bolivarian bourgeoisie" of state, whose main business is to receive money for imports. Is it true that there is a conspiracy of businessmen and traders to hide food in warehouse? I'm not going to defend a businessman, and surely there are many criminal entrepreneurs, like thieves in other sectors of an economy that depends on the state. But this isn't the main reason for food shortages in the country, what the government called "economic warfare". Two facts: 1 ) The two state food distribution chains (PDVAL and MERCAL), suffer the same level of food shortages that private companies, 2) The largest and most important private entrepreneur of country food sector, Lorenzo Mendoza, has met several times with President Maduro to increase production , which is a public and notorious news. Beyond the partisan blinders, are we not also watching the decline of oil revenue system? What is the responsibility of the Chavista state to this corruption? President Chavez himself called his project "oil socialism", regardless of the social and environmental consequences of the production of oil, gas and mineral resources for rural and indigenous communities. In fact the so-called "Patria Plan", in the plan of government of President Maduro, states to double by 2019 energy production in the country. Oil money, managed by the state, has corrupted social movements, who have given up independence and autonomy for receive a little bit of oil revenues. In a tight and short review, during the past 15 years power conflicts between the government and the opposition, can be characterized like as a clash between two bourgeoisies equally capitalists , in order to control oil revenues. Where are the social reforms and the fight against poverty? They are deepened sufficiently? Due to the increase in oil prices in the international market, the government of President Chavez, counted, during 2004 and 2009 with higher state's revenues in Venezuelan history the last 30 years. Despite having so high income and political control of the country, structural reforms were not made to causes of poverty in the country. From 2005 compensatory social policies were promoted, called "missions" that had a positive impact on the living standards of the poorest sectors of the population, in that way, they had a greater purchasing power of products, with the paradox of not leaving poverty. However, these "missions", were sustainable only with a high foreign exchange earnings, as a result of high oil prices on the world market. Since two years, these policies have been phased out or have been stagnated. An example today is the disastrous situation of the network of public hospitals in the country that do not have the equipment, infrastructure or medicines to cure different diseases of the population. This has led to a paradox within the government that calls itself "socialist": In the absence of an effective public health system, all state employees are insured for hospitalization, surgery and maternity in private sector's clinics. What is the real level of threat to the ultra-liberal right? Can you say that there is an attempt to destabilize the power? To that question, several comments as a response: 1) The opposition is divided and internally facing, and today doesn't have a unanimous position on street protests : One sector supports it and the other one simply criticizes it 2) Venezuela is in the process to transition towards "something else", because of the physical absence of Hugo Chavez, that some political analysts call "postchavismo". Regardless of how that transition could be completed and how these protests finalize, there is no way that the Bolivarian movement, broadly defined, is be completely displaced from power. Chavez has a wide base of support making it a major player in the short and medium term policy in Venezuela. So the result , now or later, will be the negotiation between a sector "Chavista" and another part of the "opposition " when necessary to ensure the country's governance; 3) In 2002 began a purge of middle and senior cadres of the army in Venezuela , so today the Armed Forces are committed to the Bolivarian government project, not only for ideological reasons, but also for economic. Never before have the military, who now exert numerous positions in the public service, have had controlled so many legal and illegal businesses in the country (for example, control of the ports for imports and exports of good ). For this reason there are so many possibilities that a "right-wing coup" - linked to opposition sectors - as a coup "left-wing" - a sector of Chavismo against Maduro -. In conclusion I must say that we the anarchists, along with other sectors of Venezuelan revolutionary left, equally reject the government and the opposition political parties, trying to build a social alternative, which in this case is called "libertarian". At this time we have denounced the government crackdown on protesters and the implementation of a package of economic measures has been downloaded on the shoulders of the people, the crisis created by government corruption and the old and new bourgeoisie in the country. The print media is split between pro-regime (eg Ultimas Noticias) & anti-regime (eg El Universal). Well worth translating IMO, if only to end once and for all the lazy, ubiquitous assertion that the only folk who protest in Venezuela are from the middle/upper classes, perpetuated by the likes of David Ferreira and the international prochavista left.